I held my prime ground as the crowd filled in around me. I had biked to Lugo – the start of the 9th stage of the Giro d’Italia. I had a great view of the cyclists coming in and the mass for the start. The team cars with bikes on the top. And the endless entertainment of the crowd who had turned out to support their favorites. Pink – the color of the leading jersey – was the color of the day. 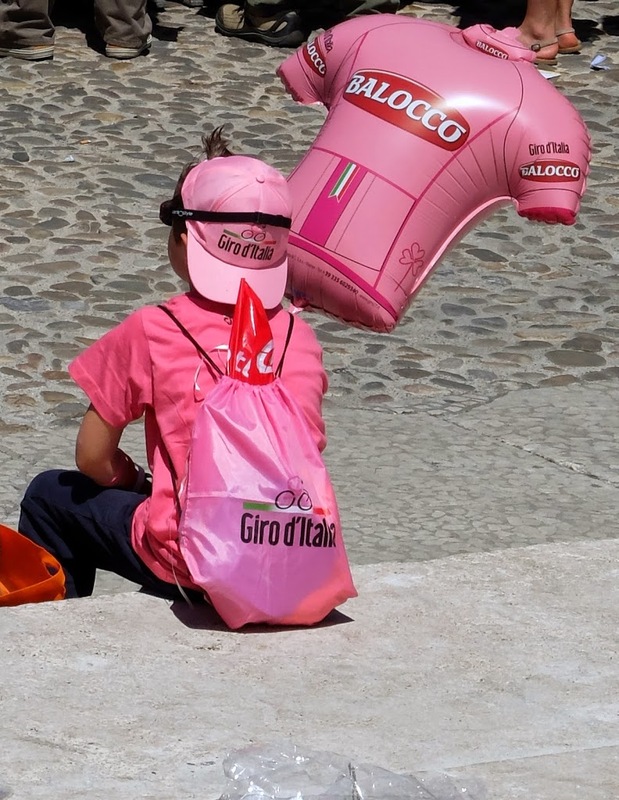 Kids were dressed head to toe in giro pink swag. The dogs wore pink t-shirts. The stores had pink balloons and decorations. 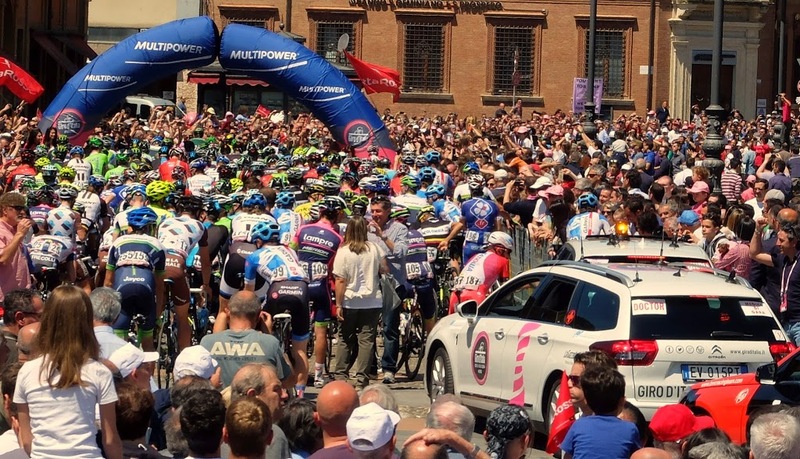 And thousands of people turned out to send off the cyclists on the biggest race of the year in this cycling-mad country. Ivan Basso – famous pro cyclist from Italy is racing here and drew big cheers, as did other Italian favorites. And Cadel Williams – the current leader wearing the coveted pink jersey drew cheers and applause as he rode through the crowds pressed on either side of narrow corridor cyclists passed through on the way to the start. They love their cyclists in Italy. I’ve seen bike trails with plaques dedicated to their racing champions. Every weekend I see pelotons of cyclists on beautiful road bikes in bright kits blasting around in focused pacelines. Many cyclists give a hearty Ciou as they fly by like the hare passing the tortoise as I plod along on my touring bike loaded down with panniers and give them a friendly Ciou and a wave back. The country around Brisighella is made for the beautiful light carbon climbing machines that zip up the hills. While I can get up them on my touring bike, it’s a lot of work and a lot of weight and it takes a while. But then Italy is famous for its bikes and components and has set the standard for the world. But more than the professional cyclists, and more than the spandex-wearing road enthusiasts, I love watching the old ladies bump along through the city center on their bike with a basket. The old men congregating in the city square with their bikes casually propped against the wall of the bar. The bike zipping around casually as everyday transportation and it’s so taken for granted it’s not worth comment. Nothing special – just the way you get around. It’s great fun to watch the races and see the peloton and covet the fancy bikes and appreciate the athleticism to ride so fast and climb so well. But I think I’d rather be bumping along with my bike and basket when I’m an old lady, and hope we can get our infrastructure to the point where that’s possible and nothing special – it’s just the way you get around. This is so much fun. What a great experience. I hope if you are not wearing a pink jersey you are wearing a pink jersey in spirit! You are my champion!! !